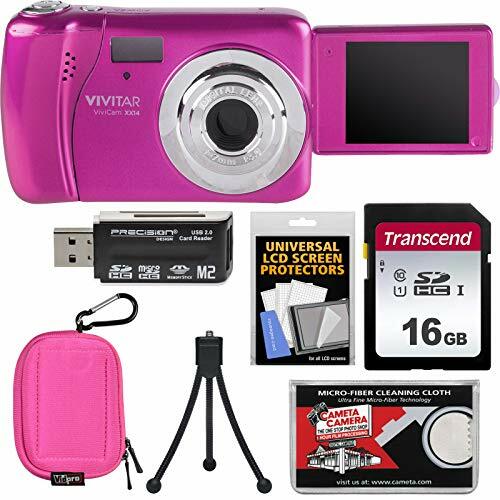 The compact, lightweight Vivitar ViviCam VXX14 Digital Camera combines a 20MP sensor with HD 720p video. Selfie shooters will enjoy the bright 1.8″ LCD screen that flips out and rotates a full 180-degrees to face forward. Features fixed 7mm f/3 lens, 4x digital zoom and built-in flash. Requires AAA batteries (not included). Take more high-resolution pictures faster (up to 95MB/sec.) with this Transcend 16GB SDHC UHS-I Class 10 U1 Memory Card. This convenient, slim-fitting neoprene camera case sleeve is designed to protect your digital camera from bumps and scratches. The Vidpro CS-10 features a built-in rigid plastic shield that offers additional protection for the camera’s delicate LCD screen. Includes shoulder strap and carabiner clip.